A healthy, glowing, and youthful skin is a dream of every woman. But most of us are hardly blessed with a flawless skin that is healthy from inside out. Hence, we resort to premium cosmetics or natural beauty remedies to take great care of our skin and look our best. However, there are times when they fail to live up to our expectations. What if you suddenly figure out that your favorite commercial skin cream actually comes loaded with harmful chemicals? Or, maybe the DIY skincare potion you tried lately was not kind enough to your skin and gave you unsatisfactory results. Well, that is why ALASTIN skincare is here. This magical solution can give the skin a complete makeover by boosting its overall health so that you can achieve long-lasting beauty in a way that is both scientifically proven and clinically validated. Want to know more? Here is a complete guide for you. How Does ALASTIN Skincare Stand Out? ALASTIN Skincare is an innovative line of products by a specialty aesthetics company called ALASTIN Skincare Inc., situated in Carlsbad, CA. Since its establishment in 2015, the company has been on a mission to optimize the experience of its customers through groundbreaking scientific technologies and its fastest-growing physician-dispensed product line. The industry-wide recognition of ALASTIN is attributed to its patented TriHex peptides, which help maintain healthy skin for a lifetime by protecting, strengthening, and reinvigorating it. The brand has also been honored as the ‘Cosmeceutical Range of the Year (2018)’ with three prestigious MyFaceMyBody awards (the internationally respected “Beauty Industry Oscars”) for its outstanding innovation in anti-aging and post-procedure skincare technology (1). 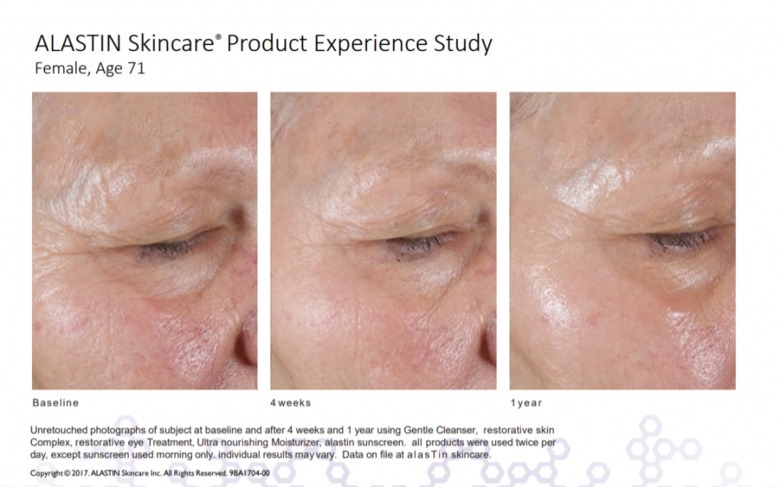 The proprietary line of skincare products developed by ALASTIN scientists is backed by breakthrough science, which sets the brand apart from tons of other premium names in the market. Human histological studies have unveiled that ALASTIN products are capable of enhancing the production as well as deposition of both elastin and collagen (the primary structural component in our skin) in the skin to a significant level. They can also initiate the remodeling and recycling of ECM or extracellular matrix (the largest dermal component supporting healthy cellular regeneration), thereby stimulating it remarkably. All these help in preparing, healing, and maintaining the skin for various ablative and non-ablative rejuvenating procedures (surgeries, laser resurfacing, micro-needling, Intense Pulsed Light or IPL, peels, etc.) by boosting its receptivity. There is no other skincare line in the market with a demonstrated history of such kind of procedural enhancement. In short, ALASTIN skincare offers the first-in-class system for plastic surgeons and dermatologists with specifically formulated products that aid in improving their procedural margins by delivering faster, better, and longer-lasting outcomes. Aging and too much sun exposure can break down the collagen and elastin proteins in our dermis, which clump together and slow down skin’s natural rejuvenation process. As a result, the natural protective barrier of the skin gets damaged, thereby inviting dryness, dullness, and signs of aging. TriHex Technology helps in clearing out the fragments of aged collagen and elastin from the ECM while restoring the ideal environment for the production of new, healthy ones. Skin bed preparation is imperative for maximizing the results of procedures like healing, rejuvenation, and maintenance of the skin. TriHex Technology pre-conditions the skin bed by removing debris from it and makes visible changes at the surface level of the skin by supporting the rebuilding of healthy collagen and elastin. This strengthens the skin barrier and shields it from future damage. The skin also becomes more hydrated and more elastic with less appearance of wrinkles and fine lines. Regular use of TriHex Technology helps in replenishing the skin and maintaining its optimal health. As it promotes the reproduction of collagen and elastin, the skin gets revived from the inside out and the rejuvenation continues on an ongoing basis. Eventually, you become able to achieve a younger-looking skin with a soft and smooth texture, which lasts for a longer period of time. 12. TriHex-Pro Skin Booster Serum: A professionally-dispensed product (super concentrated TriHex Technology) that is used only with a HydraFacial (hydra-dermabrasion) procedure for clearer, more radiant skin. However, ALASTIN Skincare products are available only through authorized medical professionals to help you enjoy the maximum benefits.